Who knew that Drake had a little Puff Daddy (circa 1996) in him? 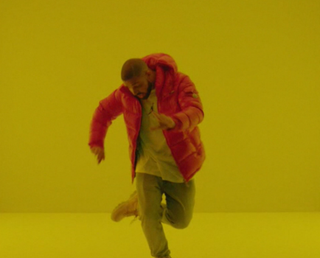 In Drake’s new video for his song “Hotline Bling,” the 6 God is twirling, diddly-daddling, cha-cha-ing and doing a lot of Diddy-isms that Puffy used to do in his Bad Boy videos back in the day. It’s Drake in rare form: a confident Drake. I can’t imagine what it must have been like on the set when the director yelled “Action!” each time, prompting Drake to spring into the little one-two steps that people only do when they’re at home, in their underwear and socks, and the blinds are pulled all the way down. People on Twitter had a field day with the video. Similar to the #BeyonceAlwaysOnBeat memes, the #DrakeAlwaysOnBeat hashtag put clips of the video to the tune of different songs, to showcase just how versatile his dancing is. Check out the funniest ones below. The simplicity of the video makes you pay closer attention to the lyrics. It’s sappy Drake, the lyrics that get him into trouble for being disingenuously, people argue, concerned for those “good women” who aren’t being true to themselves. But it’s my favorite kind of Drake, because who else articulates those sentiments better?